Recent release “For God So Loved . . . 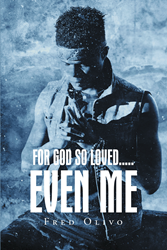 Even Me” from Christian Faith Publishing author Fred Olivo is a gripping book about a young, misguided man in New York City whose prior fate for an early death or a lifetime prison sentence changes upon encountering a mighty woman of faith and a God who makes all things new. “For God So Loved . . . Even Me”: a moving personal story about the author who grows up in a city with streets dominated by drugs, gangs, and crime. In a seemingly hopeless situation of either early death or a lifetime in prison he has a life altering encounter with God. “For God So Loved . . . Even Me” is the creation of published author, Fred Olivo, an evangelist and youth minister, serving the ministry since 1997. Published by Christian Faith Publishing, Fred Olivo’s inspiring story shows that anyone with a dark past and a heavy baggage of sins can still be forgiven and redeemed. All it takes is a sincere heart, the desire to change for the better, and asking the Lord for mercy, forgiveness, and wisdom to live life to the fullest. This is indeed an eye-opener for anyone who lives in sin and wants to turn his or her life around. View a synopsis of “For God So Loved . . . Even Me” on YouTube. Consumers can purchase “For God So Loved . . . Even Me” at traditional brick & mortar bookstores, or online at Amazon.com, Apple iTunes store, Kobo or Barnes and Noble. For additional information or inquiries about “For God So Loved . . . Even Me”, contact the Christian Faith Publishing media department at 866-554-0919.